Hi, I am interested in your 1959 Mercury M-100 (stock #1005-NSH) listed on Autotrader for $68,995. I'd like to get more information about this vehicle and confirm its availability. A 1959 Mercury M-100 is already a head-turning sight, but this one is far more desirable than just rarity. Its a true one-of-a-kind restomod that has beautiful paint, a full custom luxury A/C interior, a big Lincoln V8, overdrive transmission, fully independent suspension, and so much more. So look over all the details on this fresh build and think about all the awards you want to win. 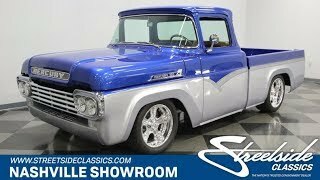 Youll love the way people will approach this pickup thinking its a spectacularly-presented Ford F-100, and then youll watch their delight as they see the Mercury badges. This is one of those rare pickups developed primarily for Canadian dealers with no Ford outlet nearby. But the history and those bold Mercury badges are not what make this such a stellar machine. Its the fact that the consignor/constructor spent over $120k making sure that every inch of this truck is a memorable machine. The House of Kolors True Blue gives the gentle curves an almost gem-like quality even in the truck bed. And the Ingot Silver Metallic borrowed directly from modern Fords continues to make the super-straight sheetmetal look like precious metal. Plus, we know you absolutely love the air-brushed steel details that separate these two colors in a similar pattern to some of Fords most iconic 50s sedans. The bumpers were eliminated with flush panels, the door handles are shaved, and other trim was expertly removed. This not only adds to the trucks overall sleekness, but also it means the other brightwork can command the right attention. It includes the chrome grille, trim around the desirable wraparound back window, and the distinct Mercury badging. Plus, the Billet Specialties Magnitude wheels not only add to the shine, but also the 17/18-inch front/rear stagger over the lowered suspension gives this a true street-eating stance. Youve seen custom interiors before, but none have been as carefully crafted as this. The bench seat has the correct bolstering for individual comfort. The leather looks like a bomber jacket and feels just as soft. And this is fully coordinated with the custom headliner, carpeting, lower dash, and door panels. And speaking of the door panels, look at the classic style speaker grilles these are a custom piece that keep the vintage atmosphere while allowing for modern speakers behind it. This kind of thoughtful integration is everywhere, including on the power windows, power locks, cup holders, and AM/FM/CD stereo with aux input. Youll even love how the air conditioning control have been added to the bright blue dash. But this custom is also a true drivers machine. Thats why you have a Billet Specialties steering wheel mounted on a chrome Ididit tilt column. And beyond that, the bright panel gives you a full set of crisp Dolphin gauges. The engine bay continues this award-worthy arrangement. The smooth blue fender walls and firewall funnel all your attention to the highly polished total presentation. A premium truck deserves a premium motor, and so youre looking at a big block borrowed from a Lincoln. The 460 V8 was bored to 472ci, and it was rebuilt for extra performance and fortification. This includes a large Edelbrock 750 CFM four-barrel carburetor, Edelbrock intake, Edelbrock heads, MSD ignition, and ceramic coated headers. Of course, youre going to want to do more than just listen to the rumble of the dual exhaust; follow its path in the undercarriage photos. There youre going to see the kind of amazing paintwork that many people dont even have on their exteriors. And it continues to look so fresh because theres only 450 miles on this build. Of course, youre also amazed by the huge list of suspension upgrades. They include the tubular A-arm front end, full adjustable coilovers, and four-wheel disc brakes. And when was the last time you saw a truck with a Jaguar-style Heidts Independent rear with inboard brakes!? Oh yes, this is truly an amazing build. And its even easy to show this Mercury off everywhere with great features like the aluminum radiator, power steering, and four-speed automatic transmission w/overdrive. Theres just so much to go over on this one that we dont have the room for it all. So give us a call for all the details. But you already know one-of-a-kinds like this rarely leave their creators hands. So dont miss this opportunity, call today!